VolvoThe Volvo initial public offering is officially off. The Swedish automaker Volvo has confirmed plans to shelve an initial public offering potentially worth $US30 billion. Volvo previously blamed President Donald Trump’s trade war for postponing the share sale. “There are no plans or time schedule for entering into the equity market,” Hakan Samuelsson, Volvo’s chief executive, said Wednesday at the Los Angeles Auto Show. Originally scheduled for September, Volvo’s IPO but was postponed by the firm’s parent, Geely. The Swedish automaker Volvo has confirmed plans to shelve an initial public offering potentially worth $US30 billion, having previously blamed President Donald Trump’s trade war for postponing the share sale. 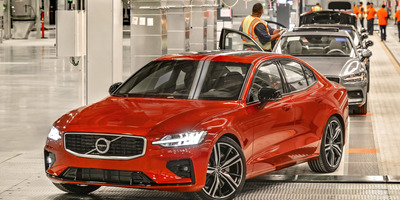 “There are no plans or time schedule for entering into the equity market,” Hakan Samuelsson, Volvo’s CEO, said Wednesday at the Los Angeles Auto Show, according to Reuters. He added that the Swedish firm was also not looking to raise money through bonds. Samuelsson’s confirmation comes about three months after the IPO was scheduled, only to be postponed by Geely, the Chinese auto giant that owns Volvo. The postponement, which paused plans for an IPO that valued Volvo at $US30 billion, came as the carmaker worried US President Donald Trump’s trade war could hurt its valuation. “Conditions right now are not optimal to give certain upside for the investors,” Samuelsson said at the time. In September, Geely said it had secured the backing of investors, but it was said to be worried that Volvo’s stock could slip in the immediate aftermath of the flotation, angering Swedish pension funds. The IPO would have been the largest in Sweden since the telecom firm Telia listed in 2001. Trump’s trade war, however, appears to have derailed the listing, with the threat of auto tariffs looming large over the car manufacturing sector. Trump has threatened to impose 25% tariffs on all autos and auto parts coming into the US to extract concessions from trading partners including the European Union and Canada. He is yet to follow through on such threats, but earlier this month it was reported that the White House was circulating a report discussing the prospect of auto tariffs. The trade war is at a crucial juncture, with Trump and Chinese President Xi Jinping set to meet at this weekend’s G20 summit in Buenos Aires, Argentina. Observers are hoping the two strike an agreement on trade that would prevent the US from raising existing tariffs to 25% from 10%. Geely, which also owns the British sports carmaker Lotus and the company that manufactures London black cabs, sold more than 1.2 million cars in 2017.